A Bolivian American (Spanish: bolivio-americanos, norteamericanos de origen boliviano or estadounidenses de origen boliviano) is an American of Bolivian descent. Bolivian Americans are identified as Indigenous, European (mostly Spanish or German), Afro Bolivian, or a combination of any or all three races in varying degrees of admixture. Additionally, there are Bolivian Americans of Japanese descent, albeit, in small numbers. Bolivians compose the third smallest Hispanic group in the United States, with a 2010 Census population of 99,210. 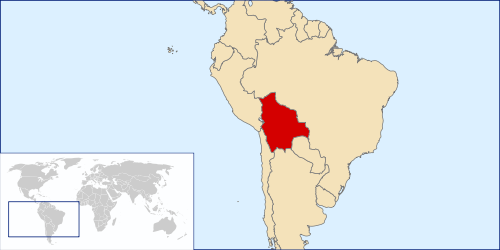 The highest concentration resides in the Washington Metropolitan Area, which accounts for 38% of the total Bolivian population in the US. Additional areas of concentration include the New York City borough of Queens, Miami-Dade County, and the cities of Los Angeles and Providence, Rhode Island. Bolivian immigration into the United States occurred in two significant phases. The first phase occurred during and subsequent to the 1952 National Revolution (between 1952 and the latter 1960s). Most of these immigrants consisted of middle- to upper-middle income occupational professionals or political dissidents, and identify with Bolivia's White or Criollo (descendants from Europeans born in Bolivia) society. The second notable phase of Bolivian immigration (between 1980 and 1988) was a result of Bolivia's fiscal policies in the 1970s which gave way to the hyperinflation throughout most of the 1980s. Most of these immigrants consisted of lower-income Mestizo ( white European / native Indian mix) and Indigenous Bolivians obtaining work posts as service and manual laborers. Many Bolivians who emigrated to the United States came as tourists. However, many remained indefinitely in the country, setting with family and friends. This made it difficult to know the number of Bolivians living in the United States. Between 1984 and 1993, only 4,574 Bolivians got U.S. citizenship. In this period about 457 were naturalized each year. Bolivians have settled throughout the United States, mainly in Washington D.C., Maryland, and Virginia; there are also large groups of Bolivian immigrants in Texas, New York City, New Jersey, South Florida, North Carolina, Rhode Island, Massachusetts, Chicago and California. The number of Bolivians in the U.S. in 2006 was estimated at 82,322. Most Bolivian immigrants are high school or college graduates; many work in companies or in government. Juan Fernando Bastos, Bolivian born, American portrait artist. Alberto Torrico - member of the California Unemployment Insurance Appeals Board. 1 2 US Census Bureau 2014 American Community Survey B03001 1-Year Estimates HISPANIC OR LATINO ORIGIN BY SPECIFIC ORIGIN retrieved October 18, 2015.